This native herbaceous perennial plant produces tall, leafy shoots with lavender blue to bright purple flowers from early to late summer. 20 inch height and 12 inch spread. 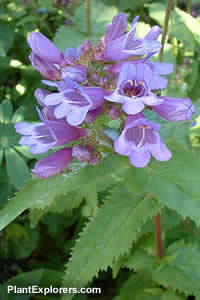 This plant is attractive to hummingbirds, and under favourable conditions will form ground covering mats. The genus Penstemon is now in the family Plantaginaceae. For maximum freshness, please keep seed refrigerated in its original packaging until it is time to plant. Sow seed in late winter or spring in containers in a cold frame at 13-18 degrees Celsius. Plant outside in the fall or early spring. Grow in full sun to part shade, and moist or wet soil.